Learn about the history of Japanese swordmanship and watch a performance from a master of Iaidō. Swords have played a very large role in the history and cultural development of Japan. Learn how to safely unsheathe and sheathe a sword, as well as a few basic moves. It's not as easy as it looks, but the master will guide you through the moves until you can wield a sword like a samurai. Once you have practiced basic moves with an imitation sword, it will be time to try out your new skills with a real samurai katana. You will certainly feel the spirit of the samurai as you slice through a rolled tatami mat. We offer a 90-minute course where you can experience a small part of samurai culture. 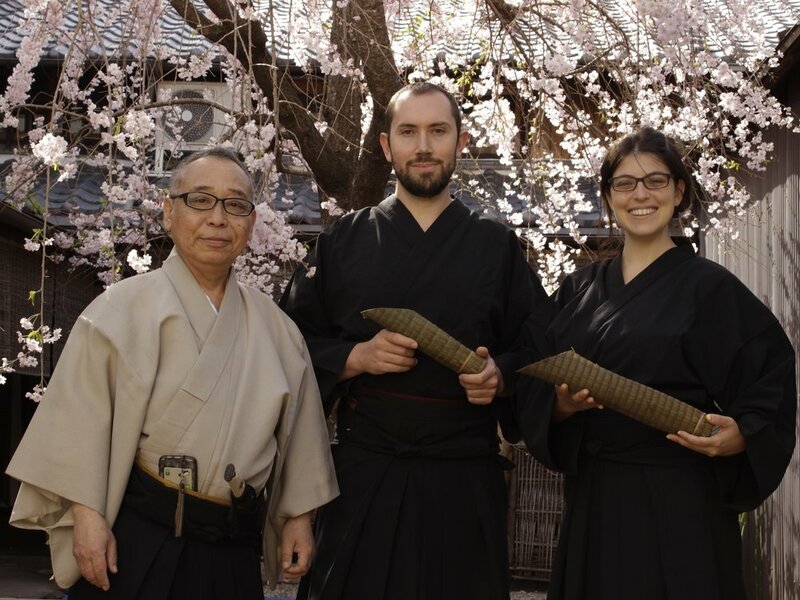 You will dress in a stunning kimono and hakama just like a samurai, learn about the history of swords in Japan, watch a performance from an Iaido master, practice basic sword moves, and then use a real samurai sword to slice through a roll of tatami. All this while surrounded by exquisite samurai armour in a beautiful old machiya Kyoto house. Full Samurai: ¥10,000 per person. Includes dressing up, practicing with sword, and cutting experience. Observer: ¥5,000 per person. Only watching the performance, no hands-on experience. Because of the potential danger of using real swords, children under 14 cannot have the hands-on experience. Children between 6~13 can observe for ¥5,000. Children younger than 6 can watch for free. Sessions start at 10:00, 12:00, 14:00, and 16:00. Language: Japanese with excellent English translation. Unfortunately we are unable to accommodate people who need translation to other languages. Guests can purchase extra tatami rolls for a further ¥500. If it is raining, we will do everything inside our beautiful dojo, but if it is sunny, we will do the cutting in the garden.